Plainsman Cone 6 Ravenscrag Slip based iron-red glaze. It can be found among others at http://ravenscrag.com. Iron red glazes are common in the cone 6 range. The red color is a product of iron silicate crystals forming during the cooling cycle in the kiln; it can be difficult to develop a process that gives repeatable results. While it would seem logical that these glazes should have a very fluid melt and a slow cooling cycle during firing to give the red iron crystals time to grow, in actual practice we have not been able to confirm either assumption. However it does appear that a thick application is needed to encourage the crystallization (and thus there is a danger that too much thickness will result in it running down off the ware). Thus experience is needed to achieve a workable thickness to be able to manage vertical surfaces. Just try to apply the glaze just thick enough that you can tolerate the amount of running. Since this recipe employs Ravenscrag Slip, its application properties are superior to many others. 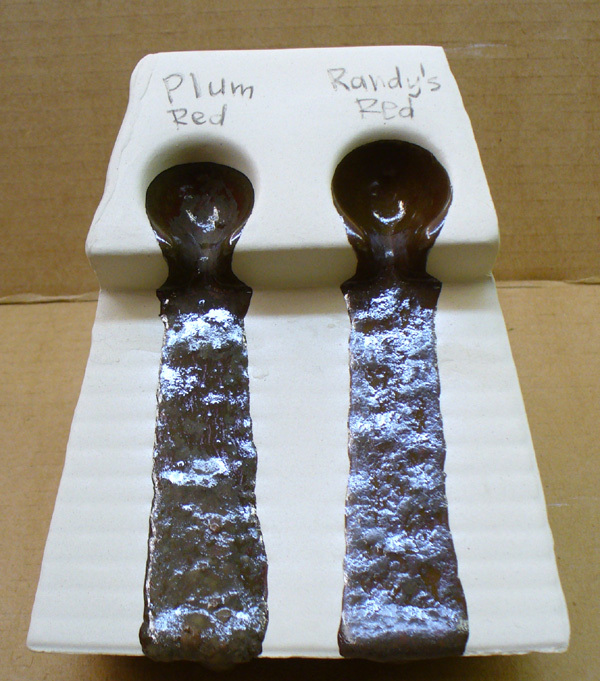 A GLFL test for melt flow comparing two cone 6 iron red glazes fired to and cooled quickly from cone 6. Iron reds have very fluid melts and depend on this to develop the iron red crystals that impart the color. Needless to say, they also have high LOI that generates bubbles during melting, these disrupt the flow here. Original development of this recipe was done to match the chemistry of Randy's Red (a popular recipe). At the time we did not do any special firing schedule to encourage the growth of the red crystals. 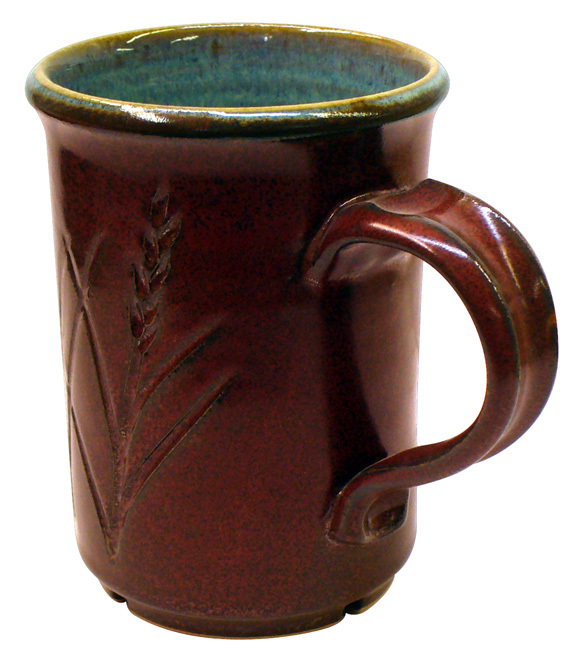 A popular Gerstley Borate based iron-red glaze. 2004-03-12 - There is much more information about this glaze at http://gerstleyborate.com. The Boraq Gerstley Borate substitute works well in this recipe.